We are a hanging scroll manufacturer established since 45 years We want to promote the charm of hanging scrolls to the world. 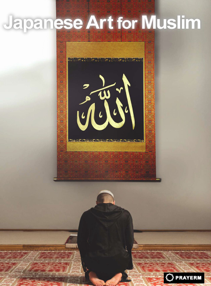 We have began to provide “PRAYERM”, hanging scrolls specially for Muslims’ use. It can be used for praying spaces in Japan and is also good as souvenirs for visiting Muslims. Hanging scrolls are the most appropriate decoration that can display Japanese hospitality. Why don’t you try to show Japanese hospitality with PRAYERM, the hanging scroll made for Muslims? Also, as the hanging scroll can be rolled up and be stored, its compact and lightweight properties make it a good choice as a souvenir for Muslim visitors. Please consider the collaboration of Japanese traditional hanging scroll and Islamic art as interior artpiece for your use. 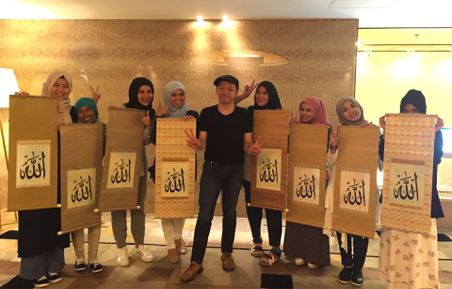 Feature: The brand name PRAYERM came from the word Prayer + the ‘M’ from the word Muslim. This orginated from the thought of wanting Muslims to use it for their praying. 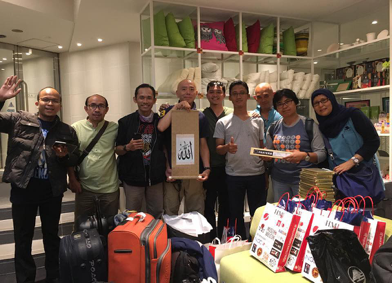 Feature: Souvenir for Muslim visitors. 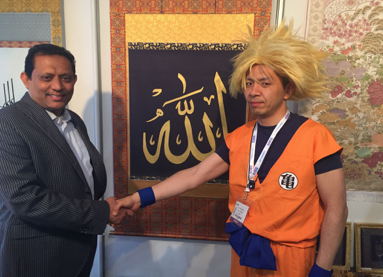 Feature: It conveys Muslim-friendly intentions when used in praying spaces in Japan.